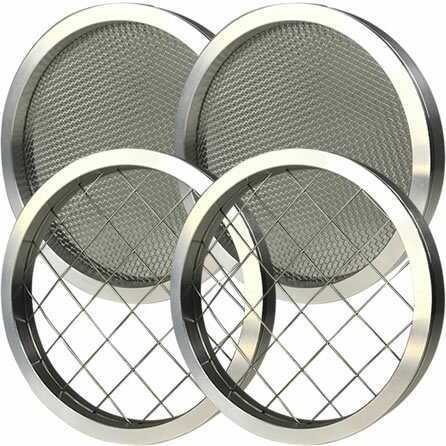 Our American made PVS-IRS3-2 dual PVC vent screen kit is designed for use with high efficiency appliances that require seasonal 3” intake and exhaust vent protection from rodents and insects. Fitment: Each vent screen in the PVS-IRS3-2 kit installs inside a standard 3″ PVC vent termination hub or coupling with a 3-1/2″ inside diameter. Our three inch PVS-IRS3-2 dual vent screen kit is a perfect solution for those who have one 3” intake and one 3” exhaust PVC vent that require seasonal protection. This discounted kit includes two PVS-RS3 rodent vent screens for use during winter and two PVS-IS3 insect and rodent vent screens that may be used during spring, summer and fall. This kit provides year-round protection from a wide variety of animals, bugs and debris. All of our PVS series vent screens are made in the United States with materials that come directly from American based manufacturers. 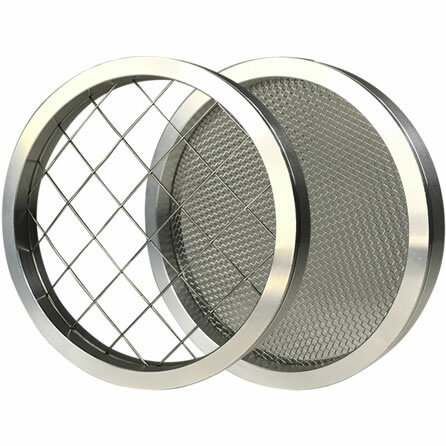 We utilize high quality 316 stainless steel screens for their great anti-corrosive qualities, which is well suited for the acidic exhaust created by condensing furnaces. Our screens are housed in an aerospace grade aluminum (6061-T6) shell, which is lightweight and also corrosion resistant. To secure our PVC vent screens inside a 3” PVC hub, we include a total of four 304 stainless steel internal wire clips that can be easily installed and removed (see video demonstration here). Installing a PVS series vent screen takes less than a minute and the internal wire clips may be reused season after season. The two PVS-RS3 rodent vent screens in this kit are designed for seasonal use in regions where snow and ice are common. During the cold months, late fall, winter and early spring, the PVS-RS3 will shield intake and exhaust vents from intrusion by animals and debris. Common outdoors pests this rodent vent screen offers protection from includes birds, chipmunks, mice, moles, squirrels and even larger animals. 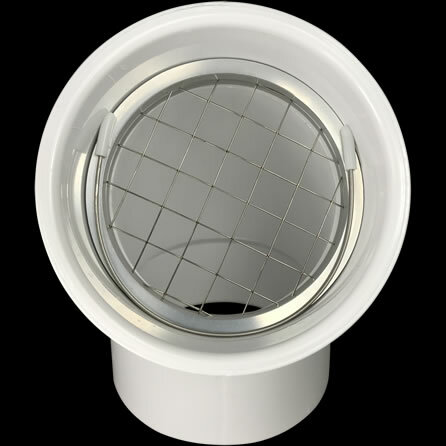 Since the PVS-RS3 maintains an industry leading 90% airflow, it is the most compatible rodent/bird screen available for modern day high efficiency furnaces, boilers and hot water heaters. Since the 2×2 316 stainless steel welded wire resists corrosion, it will not rust and fail as cheap galvanized screens do. The two PVS-IS3 insect and rodent vent screens in this kit are designed for use when insect activity is common (spring, summer and early fall). In addition to keeping rodents out of the PVC pipes, the PVS-IS3 also will keep bees, beetles, moths, wasps and many other insects outside. 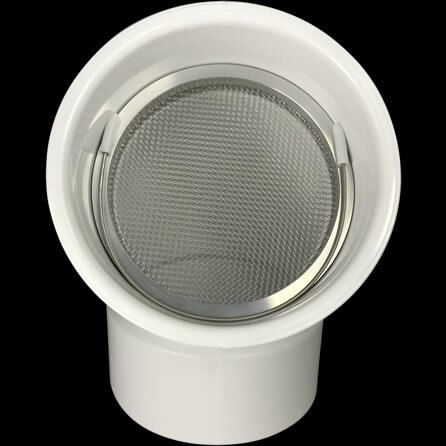 The PVS-IS3 utilizes an 18×18 316 stainless steel mesh screen that maintains a 70% airflow rate so that high efficiency appliances may breathe, while maintaining protection from nesting and curious bugs. Vent screen size assistance is readily available on our fitment page. If you are unsure what size vent screens you may need for your fresh air intake and exhaust vents, the photographs and video on our fitment page will help you easily determine the size of your existing vent terminations prior to purchase.